TSI was established in 1952, and was one of the first independent companies to provide transformer inspection & oil testing, evaluation, field maintenance, fluid handling & treatment, installation & disposal and laboratory fluid analytical services. Our customers include large and small utilities, industrial plants, commercial buildings, municipalities, schools, hospitals and in general any power generator or large consumer of electric power. Most customers are located in the eastern half of the US. TSI has an in-house analytical laboratory, a fleet of mobile fluid purification systems, tank trailers, and maintenance trucks that are fully equipped to provide on-site service and testing of transformers and protective equipment. We also have shop facilities for reconditioning transformers, switchgear and circuit breakers, including the ability to un-tank transformers for forensic investigation and repair. TSI also has an EPA regulated Annex III PCB storage facility and the necessary transporter permits to accommodate transportation for disposal of equipment and fluids at any PCB level. 1. 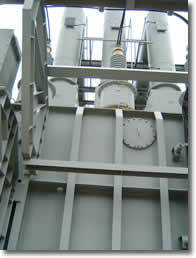 Fluid Sampling: Transformer insulating fluid is sampled annually. The samples are analyzed using gas chromatographs and other test equipment, and the results of these tests show the types and amounts of contaminants in the oil and how they have changed from year to year. The contaminants are a result of aging, overheating, leaks or other performance problems. 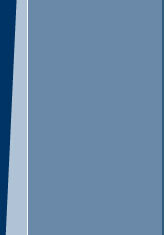 A test report with graphics showing trends and maintenance recommendations is sent to the customer. Plus, the data is available on-line through our password protected website. 2. Field Service and Fluid Purification: Items repaired include bushings, connections, circuit breakers, electrical and electromechanical assemblies, gaskets, pumps, coolers, fans, valves and gauges. Hot oil fluid degasification & dehydration removes moisture, particulate and gaseous contaminants by pumping oil through a vacuum filtration system and can often be performed with the power on. Our vacuum oil filling process is also used to ensure that all moisture is purged from a transformer during new installation or relocation. Fuller’s earth filtration is used to remove acids and polar compounds to improve interfacial tension (IFT), neutral number, power factor and color. Test results are compared to manufacturers specifications and/or performance standards set by NETA, IEEE and NEMA, and establish a baseline for comparison with future tests. Repairs or calibration needed to bring equipment into specification can be easily identified, and post repair testing assures that proper corrective action has been taken. In many cases, testing identifies the need for preventive maintenance and adjustments that preclude costly repairs, downtime and failures in the future. 4. Installation, Removal and Disposal: TSI specifies and procures replacement transformers, removes and disposes of the customer’s old transformers, and installs the replacement transformers. Replaced equipment (regardless of PCB level) is transported and disposed of in accordance with local, state and EPA regulations. 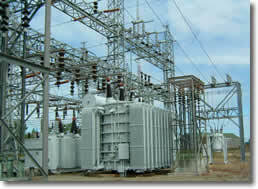 TSI has experienced technicians and engineers on standby 24x7. 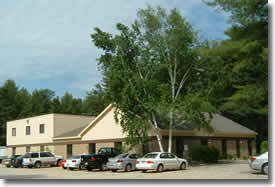 If you have experienced a malfunction or failure, call us first at 603-224-4006. This line is answered by an operator outside of normal office hours. An operator outside of normal office hours answers this line. TSI services include a wide variety of installations, tests, repairs and disposals for utilities, industrial, educational, health care and other customers. TSI is accustomed to contracting directly with customers as a prime contractor, as a member of a group of contractors, or as a subcontractor.